When the Back to the Future trilogy debuted in 1985, it was met with great fanfare and adoration. It starred an immensely popular child-turned-adult actor (Michael J. Fox), featured one of the coolest movie cars of all time (DeLorean), and boasted a box office grossing of almost $417 million for the three films. Though the iconic trilogy will go down as one of the best in the history of cinema, the movies are often talked about in the industrial sector for an entirely different reason – how accurate some of its predictions on the future turned out to be. While some predictions from the films seemed straight from the outlandish minds of Hollywood’s fiction writers – flying cars, flawless weather prediction, and Jaws 19 – others have actually evolved into real, tangible inventions. Like in the movies, flying drones are everywhere, biometrics can access important personal information, and communication through video is becoming more common than landline phones. But as revolutionary as some of that technology seemed more than 35 years ago, today it can be traced to technologies rapidly taking the world by storm in the form of Industry 4.0.
Who knew the blueprints for Industry 4.0, and other smart technologies, would be written into a comedy from the mid-80s? Great Scott! While it was never mentioned by name, the technologies predicted in the Back to the Future movies would not be possible without the development of the Fourth Industrial Revolution, more commonly labeled by those in the manufacturing sector as Industry 4.0. The First Industrial Revolution began around 1760 in England and introduced mechanization, as well as water- and steam-powered machines. The Second Industrial Revolution saw mass production and mastery of the moving assembly lines thanks to the power of electricity. 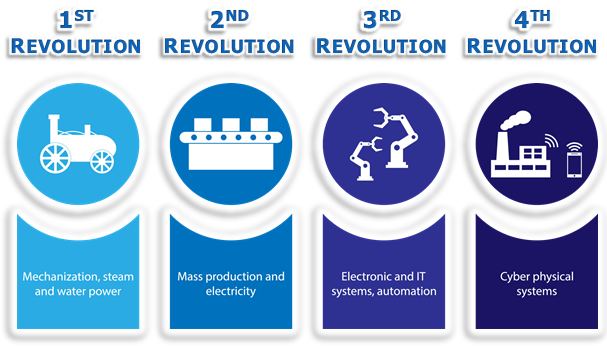 The Third Industrial Revolution came around the 1970s, and brought with it application of electronics and IT to further automated production. Now, Industry 4.0 – also known as a Smart Factory or the Industrial Internet of Things (IIoT) – refers to the trend of automation and data exchange in manufacturing. Its interconnection of industrial technologies produces big data analytics, which in turn, allows cyber-physical systems to communicate and cooperate with each other, as well as with humans, in real-time. In essence, computers and machines communicate with each other over a network without requiring human interaction, freeing up workers to focus on tasks that are exclusively human, such as invention, art, science and exploration. Currently, Industry 4.0 is poised to progress workers from assembly lines into more modern jobs. But the first step in successfully implementing Industry 4.0 technologies is to understand what they are, and how they can be utilized. A “Smart Factory” seems so futuristic until you realize how big of a role the Internet of Things (IoT) already plays in so many people’s lives. Even now, “intelligent” devices can be found in the bedroom, kitchen, living room and office. If you don’t like a song that’s playing, you can ask an artificial intelligence (AI) voice from a computer network to change it. If you’re waiting on a special delivery, you can track the package on a phone, tablet or computer. When that delivery finally arrives, you can remotely watch the postman deliver it to your doorstep via your doorbell camera. Essentially, the Smart Factory uses that same theory aimed toward the industrial sector. Right now, there are Smart Factories where machines communicate with other machines to complete tasks, all while collecting data. That information is translated into actionable insights, known as data mining, and sorted to pull out any key takeaways that help improve operations. The data is reviewed, looking for any IoT-collected information that could show predictive or abnormal trends. The insights gained from data mining eventually leads to predictive analytics, where smart sensors can be programmed to identify possible problems and contact maintenance teams to find, fix, and resolve an issue before it occurs to avoid a complete shutdown. This same intelligence can also order more production materials when supplies run low, or allow it to react immediately to issues as they occur. But the Smart Factory doesn’t stop there. While not quite the flying cars we were prepared for by Back to the Future, automated vehicles will completely change the way in which we think, and use, transport to improve manufacturing logistics. In Wisconsin, Foxconn Technology Group is planning to run autonomous semi-trucks along Interstate 94 between its manufacturing plant and the airport. In early 2018, Embark’s self-driving truck completed a 2,400 mile cross-country trip, with hopes to eliminate the need for cross-country team driving. In addition to technology, a Smart Factory will liberate workers from the monotonous, sometimes dangerous tasks on an assembly line. These workers and new workers just entering the workforce will need new skills and a firm grasp of IIoT driven technologies to enable them to thrive in this new environment. What Does Industry 4.0 Mean for Students? In short, Industry 4.0 is a brave new world. It’s constantly evolving, still developing in its infancy stage. But much like the Internet Boom, it’s something students will see much of in their professional lives. And there are jobs to be had. Currently in manufacturing, there is a skills gap, meaning there aren’t enough qualified workers to fill open positions. Essentially, there are high-paying jobs for the taking, but employers are struggling to find qualified candidates to fill them. So by exposing students to Industry 4.0 at a young age, educators are setting them up for professional opportunity and success. But even if students don’t believe they’re interested in manufacturing, they might have a slighted view of what manufacturing of the future truly entails. So while current assembly jobs may be well-paying positions, many of these jobs won’t be around forever. The fact is that many companies are utilizing more technology every day, and the workers that previously performed those tasks are being re-trained to perform monitoring, data analysis, maintenance, and other high-level tasks to support the smart factory. In the age of automation, the key to professional success won’t be measured solely on specialist knowledge. Instead, employers will be looking for more transferable skills, such as problem-solving, creativity and people management. Those skills are a far cry from what many believe to be “typical” manufacturing credentials. Perhaps most important, though, is that students have the opportunity to get a jump start on Industry 4.0 while they’re still in high school, giving them a head start on becoming an I4 expert, while preparing them for the high-paying Industry 4.0 career in local industries. That opportunity to get ahead professionally is available through Amatrol’s Industry 4.0 Fundamentals program. 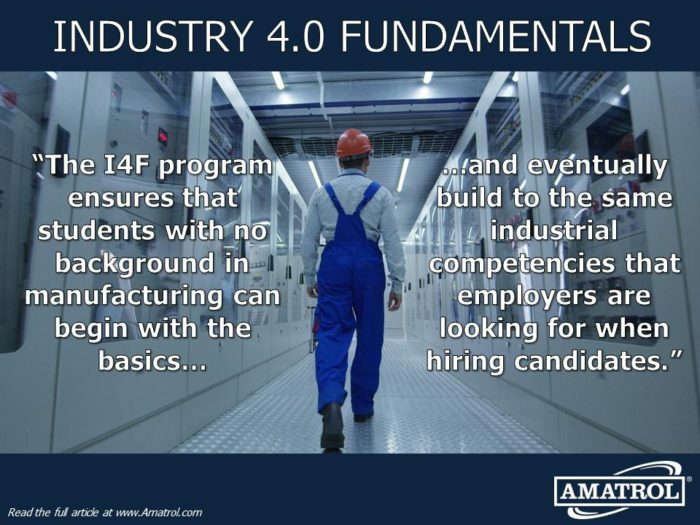 How Can Amatrol’s I4F Help to Prepare the Workforce in My Area? Amatrol’s I4F was developed by subject matter experts in conjunction with real-world feedback from industry and educational leaders worldwide. The I4F program ensures that students with no background in manufacturing can begin with the basics, and eventually build to the Industry 4.0 competencies that employers are looking for when hiring candidates. From there, the courses are divided into lessons covering major topic areas. Each course is expected to take one semester, or roughly 65 hours, to complete. Amatrol’s curriculum found in the I4F program is one-of-a-kind, equipping learners with the skills to succeed in an Industry 4.0 world. The curriculum is created by Amatrol, a worldwide leader in innovative, interactive industrial learning solutions. Designed and built by experts in their field, Amatrol’s Learning System and curriculum deliver knowledge and skills for real jobs. Built for a variety of different learning methods, Amatrol’s Industry 4.0 training program gives students a robust experience in both theoretical knowledge and hands-on, real-world Smart Factory skills through its interactive, multimedia curriculum. Amatrol’s eLearning uses eye-catching graphics, 3D simulations and videos to offer not only superb technical content depth, but breadth and strong interactivity for skill development and retention with 24×7 access. As students advance through the curriculum, they will face pre- and post-lesson quizzes, as well as classroom-based skills performance assessment. These quizzes help learners understand their strengths and weaknesses, as well as how much they’ve learned from the lessons. In addition, a performance assessment evaluates how well a learner performs hands-on skills. Those hands-on skills can be measured in two ways: through virtual trainers, or with Amatrol’s hands-on training systems. Amatrol’s virtual training uses virtual simulators to replicate hands-on equipment in such great detail that learners will feel like they are actually using industrial equipment, reproducing essentially the same tasks that they would using the hands-on systems. Amatrol’s hands-on training systems, supported with interactive multimedia, are loaded with real-world, industrial components to simulate the closest possible experience to working on-the-job. The components are heavy-duty, ready to stand up to frequent use from inexperienced users. Like Marty McFly experienced in the Back to the Future trilogy, technology is constantly changing, especially in the workforce. Old jobs are becoming increasingly obsolete, with a plethora of new jobs coming up on the horizon. However in order for students to be prepared to succeed in those new roles, they will need to be introduced to Industry 4.0 technologies at an early age. Even now, in factories all over the United States, computers have the capability to communicate with each other, as well as a management team. Using the Industrial Internet of Things, machines can even predict when an issue will arise, and fix it before a complete shutdown is needed. So with machines doing so many of the autonomous tasks, human workers will be looked upon to not only maintain these machines, but also create professional opportunities in new technology fields. With manufacturing entering into the infant stages of the Fourth Industrial Revolution, younger generations of students will need to be trained in all things Industry 4.0. 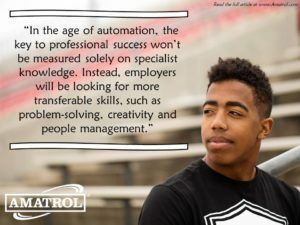 That’s where Amatrol’s I4F program comes in, ready to train your students on skills employers are actively seeking out. No matter how a student best learns, Amatrol has a solution for every type of learner. Wes Scott is a former public high school teacher and journalist. He is currently a Marketing Content Developer for Amatrol, Inc. Learn more about Amatrol and its technical training solutions, including eLearning, here and connect with Wes on Amatrol’s Twitter, Facebook, Google+, YouTube and LinkedIn pages.